Locals may have come across Castello dei Baroni at a wedding. It’s a popular venue for couples tying the knot who fancy a more secluded reception with some great backdrops for those all-important wedding photos. But it’s now attracting different couples – those who walk, cycle and fancy a sightseeing pit stop. On the Friday morning I visited recently, several chance passers-by, tourists on two legs or two wheels, popped in curious to see what this little crenelated Castello had to offer. For starters, if you’ve built up a sweat pounding up hill to Wardija from Burmarrad on the main road, you’ll be delighted to find refreshment at its garden cafe (with free Wi-Fi!). You can just pause there enjoying the seclusion and country views in this unspoilt part of Malta. But that would be shame as there’s more to it than a snack. The Castello, as it’s affectionately known, opened its doors in early 2010 as a bijou but interesting heritage attraction. It was built in 1783 as a baronial hunting lodge during the reign of Grandmaster Emanuel de Rohan. Today, Castello Dei Baroni is used as the headquarters for the Knights Hospitalliers of the Sovereign Order of Saint John of Jerusalem and the Ecumenical Order (more on that in a bit!). 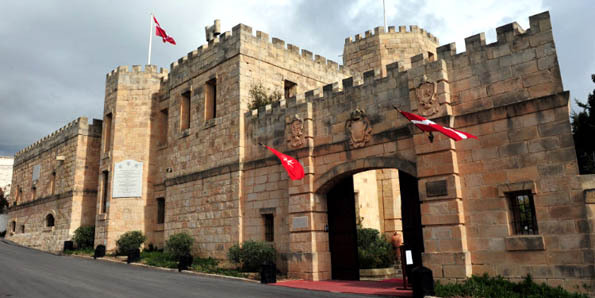 It’s actually owned and run though by Chevalier Baron Adrian Busietta and Dame Marie Angelique Caruana, who’ve gone about renovating it, for those weddings first, and now as a mini-museum and info point on the history of the Order. In fact, this little castle is devoted to giving a unique insight into the Order. A 23-minute film takes you past where others stop – with the Knights leaving Malta in 1798 – right up to the present day. You then tour various rooms that recreate the atmosphere of the lodge in the 18th century: the ‘Grandmaster’s bedroom’ and ‘Hunting room’ for instance, as well as seeing the ‘Supreme Council Chamber’ and a library containing ancient books on doctrine and law. My son loved the regalia of the Knights in a corridor room which documents the various orders – eight in fact, hence the eight-point Maltese cross. All in all, it’s a pleasant stop over and worth seeking out whether you’re cycling or walking that way or not. It’s also a good place for group outings with meal (pre-booking required and call to discuss details). However you visit, Dame Marie-Angelique and her daughter Tamara give you a personal welcome. Entrance: Adults: € 8.50 Children/Senior Citizens:€ 6.00. Discounts for groups. Arrival – you can get to Burmarrad by route bus 580, but will need to walk a couple of kilometers up to the Castello from the junction at Scott’s supermarket. The Castello offers a pick up and drop off service directly from your home or hotel at less than a taxi. I do tend to agree that it seems a bit steep. I hope the Castello is reading as this is valuable feedback for them as they start off in their venture. Thanks for posting. It looks interesting, but I can’t help thinking that the admission fee is quite high. This seems to be a trait of many cultural attractions in Malta – especially the prehistoric sites.